Ready for bigger, more beautiful* annuals, perennials, and vegetables? 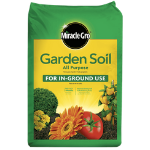 Get plants off to a great start with Miracle-Gro® Garden Soil All Purpose. Enriched with continuous release plant food, it feeds plants for up to 3 months and improves existing soil to help your plants build strong roots. This is the complete garden soil for all your outdoor, in-ground needs.